This unique 52-week devotional is packed with value and includes interactivity kids will love. A Bible story is at the center of each weekly devotion, and a two-to-four minute video is available by scanning a QR code. Plus, a free downloadable app lets kids experience a digital "pop-up" (using Augmented Reality) of each Bible story along with narration by Jenna Lucado Bishop. 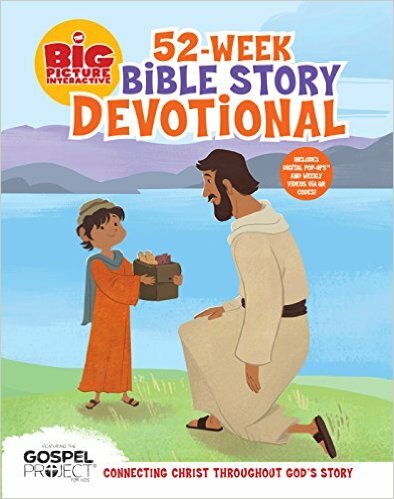 The Big Picture Interactive Bible Story Devotional is the perfect way to bring the Bible to life in a kid's heart! The Big Picture Interactive 52-Week Bible Story Devotional by B&H Editorial Staff is amazing! I absolutely love this devotional and so do my kids. We've being reading this The Big Picture Interactive 52-Week Bible Story Devotional every morning and I can't tell you how amazing it is to start you day! It helps my family and I focus on what's important and well as draws us closer to God. I also absolutely love the ree Augmented-Reality app that brings the art and story remarkably to life as digital "pop-ups" with audio narration. It's a fun way to go through this devotional adding a little more content to an already awesome devotional. I highly recommend this recommend The Big Picture Interactive 52-Week Bible Story Devotional! You can find The Big Picture Interactive 52-Week Bible Story Devotional: Connecting Christ Throughout God's Story by B&H Editorial Staff on Amazon, Barnes and Noble and other bookstores.